is stamped with Print Pattern in Always Artichoke craft and Weathered in Close to Cocoa. The Always Artichoke layer is stamped with French Script in AA and Itty Bitty Backgrounds in both White craft and Close to Cocoa. 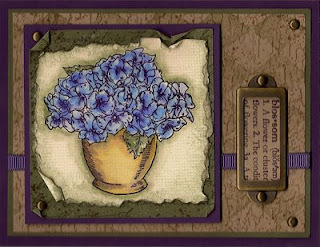 The image layer was watercolored, outlined with Sahara Sand and Always Artichoke, then overstamped with Canvas in Sahara Sand front and back (so it shows when the edges are rolled), then the edges were sponged, front and back. GORGEOUS! Has a vintage feel!